Description: Imagine finding your first love, only to be ripped apart by the apocalypse. Peyton Anderson will never forget the day she was forced to make a choice–between her family–and Chris Parker, the boy she’d given her heart. Now, four years later, as she steps from the fallout shelter and into a dead and broken world, he’s the only thing on her mind. All Chris “Chase” Parker wanted was to take Peyton away and keep her safe from harm. But he waited for hours in the rain on judgment day and she never showed–breaking his heart without ever telling him why. Now the two of them have been thrown together once again, reluctant chaperones to a group of orphan children in a post-apocalyptic world where the dead still walk…and feed. As they begin their pilgrimage to the last human outpost on Earth, can they find a way to let go of old hurts and find the love they lost–all while attempting to save what’s left of the human race. 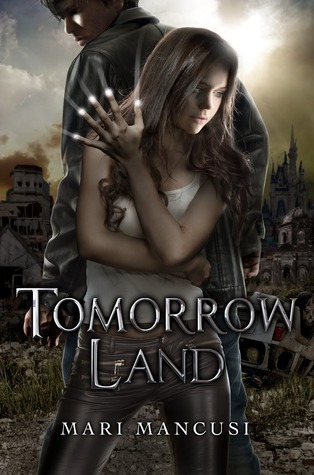 Review: Tomorrow Land is a post apocalyptic story based in a devastated US. The world has succumbed to what’s believed to be a Super Flu Virus. Peyton Anderson is a 14 year old girl whose only concern is to be able to keep her boyfriend Drew by her side and by doing so making sure Chris “Chase” Parker stays away. All is going well until everything in her life starts turning upside down. Peyton’s father is a scientist who is obsessed with what most believe will never happen, the end of the world as they know it. Peyton is tired of her father’s obsession, she just wants to be able to do what every other kid is doing, playing SIM with her friends, shoot basketball after school and enjoy her time with her boyfriend. However, her father has a whole different plan for her. She will be in charge of saving the world once the apocalypse hits. After Peyton & Chris witness a neighbor succumbing to the deadly virus and Chris’ care towards the elderly, Peyton realizes that Chris isn’t the “tech head” everyone thinks he is. After people start getting sick and disappearing, Peyton and Chris embark into an adventure to find out what the government is hiding. When I started reading this book I saw promise but soon enough I started seeing things that made me wonder if I was going to be able to maintain concentration. The book flows as a series of flashbacks that in terms allow the reader to understand or at least imagine the path of the story. I wasn’t sold on the idea since I got confused a few times trying to understand the origin of certain decisions. This book wasn’t a page turner for me, and I actually had to put it down a few times. The book has a nice plot, the story is promising but the characters are typical of the YA genre (love/hate relationships, sudden cheesy lines and promises of love & eternal happiness). I would’ve liked more background on the type of work Peyton’s father did so that I could’ve understand his decision for doing what he did. I also would’ve liked to see more development on the characters. I am not sure if it was my lack of concentration or that I found the characters dull and the storyline so similar to other Dystopian books I had read in the past. I couldn’t relate/identify myself with the characters, but I have to admit I enjoyed Chase. He is the typical portrait of a nerdy kid who falls head over heels for the girl he knows he will never get. The characters are likeable but the story doesn’t have that “real” effect that I enjoy so much in books of the same genre. If you enjoy Dystopia like societies, virus killing humans and creäture like zombies eating flesh then this is the book for you.